Dove has become the latest brand to spoof President Trump with an ad campaign based entirely on ‘alternative facts’, with a print ad that has gone viral on social media. The ad, which ran in UK newspapers over the weekend, gives “alternative facts”, a phrase made famous by one of Trump’s advisers Kellyanne Conway when explaining why Trump’s inauguration was more attended by Obama’s despite photographic evidence and official public transport statistics showing otherwise. 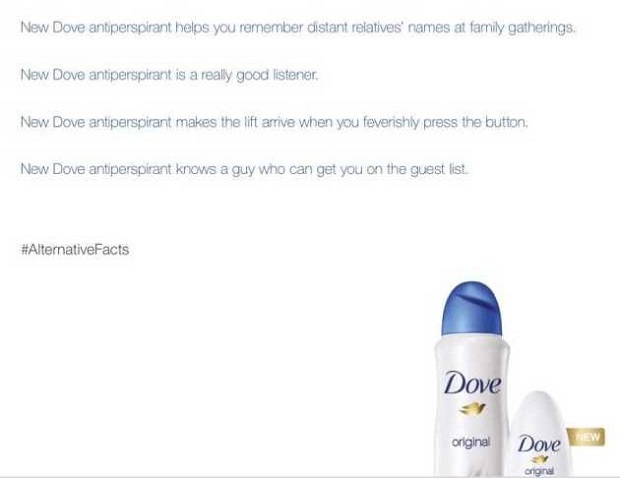 To drive the point home, the Unilver brand Dove came up with its own wild claims, such as the “ “New Dove antiperspirant increases your IQ by 40 points”. The ads, created by Ogilvy London, pair the alternative facts with real facts about the products. The move is in line with Dove’s reputation as a brand that campaigns for “real beauty”. This is the third brand under Unilever that’s spoofed at President Trump. Pot Noodle came out with a commercial that said anyone can be president. Ben & Jerry’s also released a feel-better list on Inauguration Day which included a call to donate to orgs that support African-Americans and the LGBTQ community.